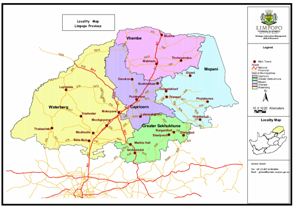 Limpopo Province is South Africas northernmost province which shares borders with Mozambique, Zimbabwe and Botswana, making it the ideal entrance to Africa. Named after the great Limpopo River that flows along its northern border, this province is rich in wildlife, spectacular scenery and a wealth of historical and cultural treasures. The Great North Road from Pretoria was first carved by the creaking wheels of ox wagons. Today, when you follow the footsteps of the Voortrekkers, you'll travel on fast, safe roads and enjoy every modern amenity as you go. Known as the Great North, Limpopo is land of legend. Ruins and relics abound in ancient forests, sparkling trout waters, hot mineral springs and waterfalls. Much of it has remained unchanged for centuries, offering unlimited opportunities in Limpopo for the enjoyment of untamed Africa. Limpopo is home to ancient lands and pre-historic secrets. This is home to Modjadji, the fabled Rain Queen, the Stone Age and Iron age relics of Makapansgat Valley and the treasures of Mapungubwe that date back to time immemorial. Limpopo celebrates a rich cultural heritage and at many archaeological sites the mysteries of the past are still being discovered. Historians reveal that the first black Africans moved across the great Limpopo before 300 AD. The Voortrekkers arrived in Limpopo in the early nineteenth century and numerous battles between the indigenous African people and the Voortrekkers took place. Then, during the apartheid regime, portions of the land in Limpopo were divided up into what then became known as 'homeland' areas. Happily, today Limpopo is united in its aim to offer the best possible welcome to all who visit this spectacular region of South Africa. The northern section and the bigger part of the Kruger National Park is located in Limpopo, and is renowned for its large herds of elephant and buffalo, significant numbers of tsessebe and sable and a rich bird life. On the park's western border, excellent privately owned game reserves and lodges offer luxurious, air-conditioned accommodation and day and night game viewing in open 4x4 vehicles. The mountainous area of the Waterberg is also home to numerous Limpopo game reserves, proving a rewarding experience of wilderness country. The Soutpansberg region, one of the most spectacular regions of South Africa, should be explored at leisure by following at least one of the forest trails. Beyond the mountains, mopani trees and giant, ancient baobab trees dominate the plains sweeping northward to Zimbabwe. Many natural heritage sites in the area are accessible to visitors. There are 340 indigenous tree species here, an abundance of animal life and the worlds highest concentration of leopard. Wide streets, jacaranda and coral trees, colourful parks and sparkling fountains characterize the principal town and capital of Limpopo, Polokwane. In addition to Polokwanes status as a major commercial and agricultural centre, Polokwane is the cultural hub of the region, featuring impressive art exhibitions and historical buildings. The Polokwane countryside is the setting for some of the most prosperous cattle ranches in South Africa. Strategically placed on the Great North Road, and halfway between Pretoria and the Zimbabwean border, this attractive city is an ideal base from which to explore. Polokwane is a popular port of call for visitors en route to the Tzaneen area and the northern part of the Kruger Park. The options for holiday pleasure and accommodation in Polokwane and its surroundings are virtually endless, whether as a pleasant en-route stopover or a destination in itself.